More Kent family/ancestral news, but of a somewhat sadder nature. Just got word of the passing of my Aunt Virginia Plotts Kent, wife and widow of my dad's youngest brother, John Paul Kent, and mother of my late cousin Christopher Kent, as well as his brother and sister Gregory and Colleen. Aunt Ginnie was a very sweet woman who suffered from adult-onset deafness; she coped through lipreading and paying very close attention to you, which gave her a warm and intimate manner that was very pleasing and kind. 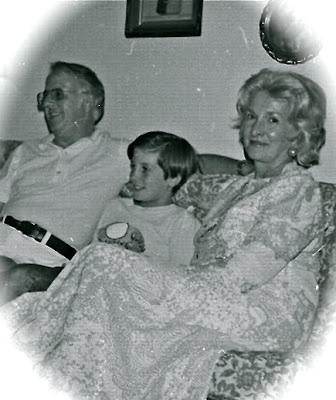 The picture above shows Uncle John, Aunt Ginnie and Christopher together as I remember them best, back in the seventies. And today they are all again reunited, with all the souls of the faithfully departed. Her departure leaves only my mother and my Uncle Pat O'Brien to represent the Greatest Generation Kents. Rest in peace, Aunt Ginnie. You were, and are, much loved.